How do we build a school culture that welcomes diversity and supports the identity of every pupil and staff member? In Rotherhithe, we have a prominent advocate for inclusion and an inspiring leader for greater awareness of the damage done in schools by bullying and pejorative language. 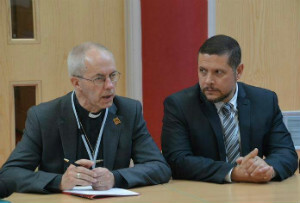 Shaun Dellenty (right) is Deputy Head of Alfred Salter Primary School, a gay man and founder of Inclusion for All. As a consequence of these findings, Shaun prepared sessions for staff and spent time working with the whole school opening up the issue. 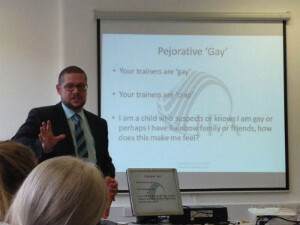 He used the film Fit (2010) to introduce the themes with staff and asked everyone to think about how the word ‘gay’ was used negatively in so many contexts. He shared his own harrowing story of homophobic bullying and made it clear that his identity was as a gay man. He set up Inclusion for All as a way of responding to the demands for help that soon started flooding in. The number of different sorts groups that responded is huge. Other schools got in touch and Shaun began helping staff teams start to look at identity bullying for themselves. 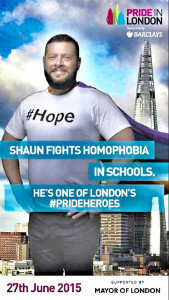 Stonewall – the LGBTQ charity – contacted Shaun about a poster campaign they were planning for schools and the Department of Education from Whitehall asked for a ‘how to do it’ booklet but soon realised that the printed word might not be the best way to raise awareness. It was when the Evening Standard headlined a comment Shaun had made as saying that schools should “treat homophobia like racism” that the national press got interested! Shaun’s background includes years as a professional actor. Indeed he still holds his Equity card with pride! When the idea was floated that a theatre company – HyperFusion – might be interested in developing an interactive theatre piece for schools around bullying, he was delighted to become a part of the process. Sarah Ellis from the company came along to the training and some of Shaun’s speaking events and together with her company and Shaun have now put together a workshop-come-performance. 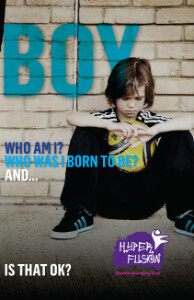 The title is BOY and is going to launch in February 2016 during LGBT History Month. The piece is aimed at Key Stage 2 and 3 pupils from 7 through to 15 years old. Shaun says it’ll work best with groups of 30-60 allowing interaction. He is clearly energised by these new challenges and looking forward to taking it out on the road. Want to see BOY for free? HyperFusion will be giving Southwark school staff the opportunity of a taster at the launch at Alfred Salter Primary School on Tuesday 23 February 2016 at 18:30. Shaun has recently helped Amnesty International UK develop their LGBTI Rights Activity Pack for teachers exploring the human rights of sexual and gender minority groups with children and young people. Find out more here.